After experiencing some success with this strategy, I now have a requirement that my total investment in all LT holdings can not exceed my total realized gains for this basket strategy. My total exposure is currently under $7,000. 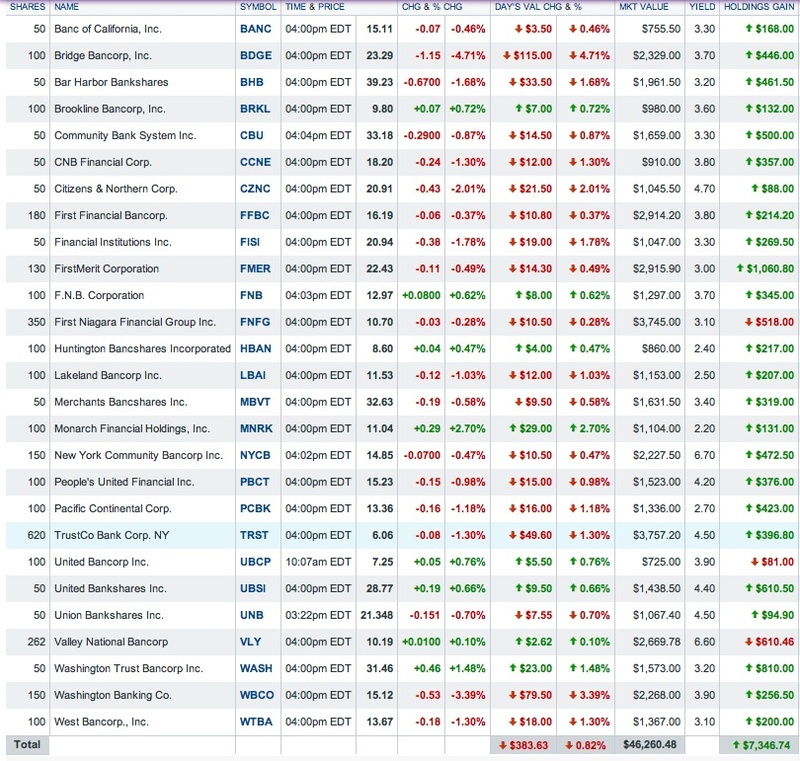 I am not finding much of anything to buy in this basket, other than gold mining stocks, but they look to hot to touch. My largest unrealized loss continues to be Velti at -87%. I have had several come back from 50% to 70% unrealized losses but none as large as 87%. Gastar Exploration (GST) is a small energy exploration and production (E & P) company. Based on the estimates made by seven analysts, the current consensus E.P.S. for 2013 is $.38 and $.46 in 2014. GST Analyst Estimates The forward P/E would therefore be 5.83 based on the forward 2014 estimate and a total cost per share of $2.68. The company has been selling some some assets. Back in April, the company announced the sale of 16,300 net leaseholds acres in the Hilltop area of East Texas for $46M, subject to a subsequent accounting adjustment. 8-K Asset Disposal That transaction was recently extended to give the buyer more time to secure financing. 8-K Cubic Extension 3rd Amdmt The new deadline is 7/1. My curiosity was aroused further when I noted that this case, filed by Gastar against its insurance company, was not even mentioned in the 10-K section involving litigation. The brief description provided by the Lexis Nexis link given by that author referred to a "fraudulent investment scheme involving thoroughbred breeding mare leases". Say What? Horses? Isn't Gastar an a E & P energy company? Well that just aroused my curiosity, needless to say, and I have left some comments and links to court decisions and SEC filings in that SA article. The author did not want to discuss it. I wonder if he has figured out my work history by the fact that I found so quickly a very recent U.S. Sixth Circuit decision affirming a summary judgment issued by a Kentucky federal judge. That is something that your average SA commenter is not likely to do. If GST eventually wins the case, it will receive monetary damages in some amount. Since GST has not issued a press release or discussed this case in its SEC filings, to my knowledge, I can not estimate that potential recovery without knowing the deductible and the policy limits, as I noted in a more recent comment to this SA author's latest bullish article published at Seeking Alpha, where he stated that a favorable result "could return an additional $.42 per share of cash to the company". Since GST has around 64 million shares outstanding, that $.42 cent per share number assumes that the entire settlement amount and attorney's fees would be recoverable when and if GST wins the insurance coverage issue. That would necessitate a relatively low deductible and a high policy limit. I seriously doubt that any information about the deductible and policy limit has been made public in court filings. GST may have made statements in its complaint about the amount of attorneys fees paid by it and the settlement amount. Even if those statements are made, this would not give me any non-public information about the potential recovery amount under the policy, unless I knew the policy limits and the amount of the deductible. As I noted, it is not uncommon for a company to self insure with a high deductible and even have some kind of sharing agreement for costs when there is a high deductible (e.g. 2 million). I have no idea about Gastar's insurance policy since there are no press releases or documents filed with the SEC disclosing the policy limits and deductible information. It is certainly possible that all or virtually all of a settlement amount, as well as reasonable attorneys' fees incurred in connection with that prior litigation, may be within the policy limits and the policy very well may have an extremely low deductible. I have no way of knowing one way or another since there has been no public disclosure in a means accessible to an individual investor. I am not offering an opinion on the outcome or the potential recovery since GST had not disclosed the material and relevant information including its policy limits and deductible. The personality and maturity, as well as the writing skills, of the young author of those GST articles are on full display in his responses to my inquiry on the source for his $.42 per share number as well as his previous responses to questions about the Mare Lease litigation matter in another one of his frequent bullish articles on GST. I would view the CEO's confirmation of that number as an approximate measure of damages, given GST's size, debt and current financial resources, to be very material information to me as an investor, assuming that has occurred and I can not make an assumption one way or the other. I am not offering an opinion, one way or the other, whether the failure to even disclose this litigation in a SEC filing and/or any material non-public statements allegedly made by officers to analysts violates the securities laws. That is not for me to decide and is not relevant to my position on this matter as an investor anyway. I simply do not like receiving this kind of information from a SA author rather than in a publicly available document. In OG's Qualifications and Lack of Qualifications, I readily admit to being ignorant about securities law. As an investor, I view this material as unquestionably material to my investment decisions relating to my Gastar common stock. B. Sold 50 NVTL at $4.04 (see Disclaimer): For virtually the entire period that I owned NVTL shares, I had an unrealized loss. The shares fell, and then decline some more, until bottoming at around $1.25 last year. NVTL Interactive Chart The stock has been impressive technically since November 2012, as noted in this article published at TheStreet. For the 2013 first quarter, NVTL did report a 22% increase in revenues to $85.9M, but there was a GAAP loss of $9.1M or $.27 per share. SEC Filed Press Release While the GAAP loss was better than a $.44 per share loss in the 2012 first quarter, I was not inspired sufficiently enough to keep the shares. The company has introduced a number of new products, but I have no qualifications to judge their potential success or lack thereof. C. Bought 100 DSS at $1.6 (see Disclaimer): Document Security Systems (DSS) is a micro cap company whose operates four business segments: DSS Printing, DSS Plastics DSS Packaging and DSS Digital. My primary interest in this company involves its patent litigation franchise. I came across DSS after reading two SA articles, one was written about the current patent litigation Seeking Alpha The possibility of a payday from that litigation perked my interest. Subsequent to my purchase on 7/12, another article was published by Seeking Alpha about DSS. DSS recently completed a merger with Lexington Technology Group, an intellectual asset property management firm. I will be referring below to Bascom Research, a wholly-owned subsidiary of Lexington. Lexington has recently filed patent litigation against five firms to date, and two of those firms have settled in exchange for royalty payments. Those two settling defendants are believed to be Broadcom and Jive Software (JIVE) who have agreed to pay royalties of 4% and 5% respectively for their use of the Bascom patents. Another defendant, Novell, is purportedly in settlement discussions. The two big fish are Facebook and Linkedin who are not likely to be pushovers and may easily decide to take the case to the mat. Bascom Research, LLC Files Patent Litigation Lawsuits Against Facebook, Inc. and LinkedIn Corp. I looked at a long term chart after reading that article which displayed a characteristic common to LT selections: DSS Interactive Chart There is a lot of up and down chop in that chart with the most recent movement being a water fall slide to levels last seen back in March 2009. In other words, sort of a warning to just stay away from this stock and move on to something else, the sine qua non of LT selections. The recently completed merger with Lexington Technology expanded the share count to 46M and 3.4M warrants were issued to certain Lexington stockholders: Document Security Systems Completes Merger with Lexington Technology Group; Investor Update Conference (Transcript) - Seeking Alpha. As noted in that transcript, DSS will receive about 60% of funds received from the Bascom patent litigation with the remainder going to their attorneys and to a firm managing that litigation. A J.P. Moreno wrote a very long article (75 pages) about this company: DSS.pdf I just skimmed it. After all I only bought 100 shares as a Lotto and it would take me almost two hours to read the whole piece. I did read the sections starting at page 18 about the DSS history and starting at page 34 relating to the "Bascom Technology." Needless to say, the dividend yield for each position is higher than the 2.58% yield on the 10 year treasury as of last Friday's close. Some of the dividend yields are higher than the 3.61% yield on the 30 year treasury, even after the recent run up in prices, and many of these banks are raising their dividends. A buyer last Friday of that 30 year treasury bond with a 3.61% is stuck with that yield until the bond is sold. I am going to discuss some, but not all, of the earnings reports for banks currently owned in this basket. A. Peoples United Financial (PBCT): People's United Financial reported net income of $62.1M or $.2 per share for the third quarter, up from $.19 in the year ago quarter. I view this one as a marginal hold at the current price. B. First Niagara (FNFG): Sterne, Agee downgraded FNFG to underperform. Their report is summarized at Barrons.com. While the rise in intermediate and long term rates were a "net positive development" for banks, the analyst pointed out that banks with large available-for-sale (AFS) securities will be negatively impacted by the loss in value for those securities. The analyst characterized FNFG as one of those banks. The analyst estimated that AFS securities represented 386% of tangible common equity as of 3/31/13, substantially higher than the average NE community bank. Each 100 basis point decline in the AFS portfolio would cause an expected reduction in TCE of 15 basis points. The firm had a $10 price target on FNFG shares and the price recently exceeded that target. This report is helpful in understanding the downside to higher rates. While a bank's operating earnings will likely increase due to a net interest margin expansion, particularly when rates paid to depositors remain stuck near zero, the bank will suffer declines in AVS portfolio. While it is just an opinion, the benefits associated with a higher net interest margin, lower loan losses and more loans due to an improving economy, are far more important to most regional banks than lower profits from AVS securities. I would place far more value on recurring earnings from operations rather than one time investment gains or losses. The bank also has the option of holding those securities until maturity, and can ultimately generate more income through the purchase of higher yielding securities once the interest rate normalization process is complete. For the 2013 second quarter, First Niagara reported net income of $63.6M or $.18 per share, in line with estimates. The net interest margin was 3.36%, up from 3.26% in the year ago quarter. Return on average assets was reported at .77%, probably the lowest in my regional bank basket. Organic loan growth was 8% annualized compared to the prior quarter with average commercial loans increasing 10% annualized. I am gradually approaching break-even on my FNFG position. The position is in two accounts, and one of the accounts is in the green. I was bushwhacked on this one. First Niagara Dividend Slash; First Niagara: Just Another Incompetent Bank Board of Directors The stock has started to move up after the Board gave the CEO the boot. Union Bankshares reported second quarter net income of $1.8M or $.40 per share, up from $1.4M or $.32 in the year ago quarter. Total loans grew to $449.4M from $436.4M as of 6/30/12. Total deposits grew to $474M, up 3.2% Y-O-Y. The Board declared a regular quarterly dividend of $.25 per share. Union Bankshares is the holding company for Union Bank that operates 13 banking offices in Vermont and 4 branches in New Hampshire. This bank provides few details until it files its SEC Form 10-Q. The last filed 10-Q was for the Q/E 3/31/13. For the Q/E 3/31/13, UNB reported a net interest margin of 4.16% (down from 4.27%); an efficiency ratio of 68.13% (down from 76.02% as of 3/31/12); a return on average assets of 1.23%; a return on average equity of 15.36%; and a NPA ratio of .53%; all of which are good numbers (page 30). The capital ratios were at that time in excess of the minimum levels for well capitalized banks (page 47). D. Pacific Continental (PCBK): This bank declared a regular cash dividend of 9 cents per share and a special dividend of 12 cents per share. Pacific Continental Corporation Declares Regular and Special Cash Dividend I am not reinvesting the dividends. This stock was originally purchased as part of the Lottery Ticket Basket Strategy and then elevated to the Regional Bank Basket Strategy that permits a larger investment. Pacific Continental also reported second quarter net income $3.7M or 21 cents per share up from $.17 in the year ago quarter. The recent rise in interest rates had an adverse impact on MBVT's investment portfolio, which went from a "tax effected" unrealized gain of $6.03M as of 12/31/12 to an unrealized loss of $2.1M as of 6/30/13. On the flip side, the CEO noted that the "recent steepening of the yield curve should ultimately provide an opportunity for margin improvement provided loan demand is sustained". That is the underlying premise in the robust rally in regional banks over the past several weeks. I left a comment to a recent Seeking Alpha article on MBVT. Total loans and total deposits increased by 8% Y-O-Y. G. Lakeland Bancorp (LBAI): I left a comment to a Seeking Alpha article on LBAI. At the current price, this one is a marginal hold. For the second quarter, Lakeland Bancorp reported adjusted net income of $6.9M or $.22 per share, which excluded expenses relating to the Somerset acquisition, but that number included a 1.2M pre-tax gain from an early debt extinguishment. The consensus estimate was for $.18. The bank paid a 5% share dividend on 4/16/2012 which, along with the gain on early debt extinguishment, makes the comparison difficult with the prior year's E.P.S. of $.2 on an operating basis. 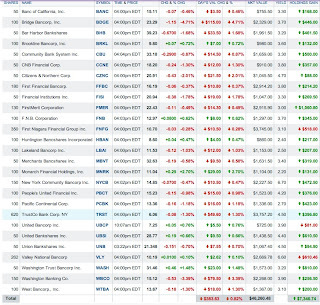 The stock reacted favorably to this report. H. FNB: F.N.B. Corporation reported in line results for the 2013 second quarter. Adjusted E.P.S. was $.21, unchanged from a year ago. I. New York Community Bank (NYCB): New York Community Bancorp reported 2Q GAAP earnings of $122.5M or $.28 per share, providing a 1.21% return on average tangible assets and a 15.9% return on average tangible equity. The efficiency ratio was reported at 41.75%. Net interest margin rose 20 basis points sequentially to 3.15% as prepayment penalty income rose to a record $44.4M. The NPL and NPA ratios for non-covered loans and assets were reported at .54% and .57% respectively. On an adjusted basis, NYB reported a $.3 E.P.S. beating the consensus estimate by 5 cents. The NPL and NPA ratios were good at .42% and .37% respectively. Charge offs were negligible at .06% of total loans annualized. Net interest margin was reported at 3.75%, down from 3.85% a year ago. The efficiency ratio was 63.53%. ROA was at .74%. Tangible equity to assets was at 9.1%. K. Financial Institutions (FISI): Financial Institutions reported second quarter net income of $6.5M after preferred dividend or $.47 per share, up from $.46 in the year ago quarter. The consensus estimate was for $.46. ROA and ROE was reported at .94% and 10.22% respectively. The net interest margin was at 3.68% and the efficiency ratio was 59.62%. The NPA and NPL ratios remained excellent at .43% and .65% respectively. L. United Bankshares (UBSI): United Bankshares reported second quarter earnings of $22.2M or $.44 cents per share, up from $.42 in the year ago quarter. UBSI is in the process of acquiring Virginia Commerce Bancorp, headquartered in Arlington, Virginia which has 28 banking offices in Northern Virginia and Washington, D.C.
UBSI has increased its dividend for "39 consecutive years". The rate of growth is slow however. The rate was $.1550 for the 1996 third quarter, so that is one slow double in the payout. 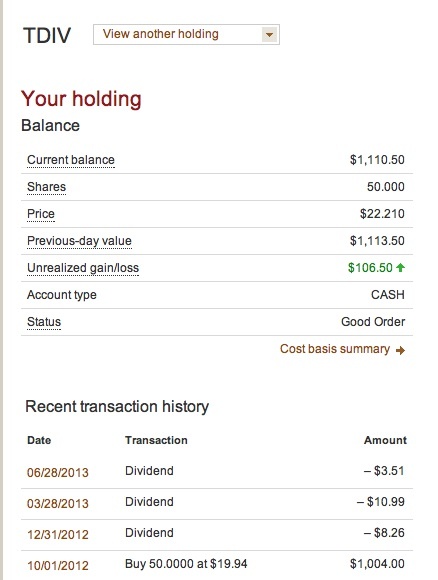 The main reason for keeping my position is the dividend. Any increase will add to my already high yield based on my constant cost per share. At a total cost of $16.56, the current yield is about 7.49% but I started out close to 7% in November 2009. M. West Bancorporation (WTBA): West Bancorporation increased its quarterly dividend to $.11 per share from $.1, announced a stock purchase authorization of "up to " $2M of the stock, and reported 2nd quarter earnings that slightly beat the consensus estimate by 1 cent per share. For the second quarter, the bank reported E.P.S. of 25 cents, unchanged from the year ago quarter which included a $841,000 unusual gain item. Bonds had a bad day last Wednesday on the heels of several positive economic reports. The 10 year treasury rose in yield to 2.61% on Wednesday 7/24/13 from 2.53% on 7/23. The 20 and 30 year yields rose .07%. While that does not sound like much, it caused this kind of decline in TLT: $107.52 -1.38 (-1.27%). Rates declined somewhat last Friday. The director of credit research at Pioneer succinctly discusses why he recommends shorting treasuries in this article published by MarketWatch. He also places odds on the bear case (25%), the base case (50%), the stagnant case (20%) and the bull case (5%). That kind of exercise is helpful, even if the investor does not agree with his conclusions, since we are all dealing with possible scenarios when making decisions now. The break-even for the 10 year TIP closed last Friday at 2.15, the market's estimate of the average inflation rate over the next ten years. If prescient, that rate would be ideal for stocks and will place a lid on a rise in rates caused by interest rate normalization. The cover story in Barrons last week was titled "Europe's Economy Will Rebound", which is not saying much. Of course, the European economy "will" rebound but the important questions are when and by how much. I noted in a post another Barrons article titled "Europe on Sale", wherein the author argued that European equities could "rally as much as 20%" in 2013. The phrase "as much" has the same meaning as "up to" which is no meaning at all. I mentioned in that article having a position in the ETF BLDRS Europe Select ADR Index Fund (ADRU), a low cost fund (.3% expense ratio) that owns 100 European market based ADRs. Holdings It is lightly traded so I would use another ETF to increase my European equity exposure now, and would consider buying the low cost Vanguard FTSE Europe ETF (VGK) which has a .12% expense ratio and about 504 stocks. The performance of European stocks has left a great deal to be be desired over the past five years, with the Vanguard ETF VGK having a five year annualized return of -.92% through 6/30/13. That would have been a good reason for avoiding a European index fund; and an even a better reason is the index's 3.53% annualized performance since March 2005, at least owning that index over those two time periods. Those performance numbers are not a reason to avoid Europe now, but instead probably justify a contrarian "bet" going forward. The question is "when" to place that bet. The U.K. reported last Thursday that its GDP grew .6% in the second quarter from the first quarter, the fastest pace of growth since 2011. The U.K. service PMI index hit a 27 month high in June. Earlier this week, Markit released its "flash" composite Eurozone PMI indexes for July (services and manufacturing). The composite output index rose to 50.4, an 18 month high. The Manufacturing PMI rose to 50.1 from 48.8 in June, a 24 month high, while the manufacturing PMI output index rose to 52.3, a 25 month high. markiteconomics The flash composite for Germany rose to 52.8 from 50.4 in June, markiteconomics. A large part of the optimism is based on the EC's prediction that the recession will end later this year and growth will accelerate to +1.4% next year. Hopefully, that prediction will prove prescient, the world really needs Europe to quit being a drag, but there is probably more hope than substance in that forecast. Europe has way too many structural problems that retard productivity, particularly in countries like France and the Mediterranean countries. An example is France's 35 hour work week and the difficulty of firing unproductive workers. Just as another example, a recent WSJ article highlighted how difficult it was to collect on an unpaid debt, a problem that is particularly critical to small business owners who make up the vast majority of employers, as in the U.S. The European system is geared toward protecting those who renege on their financial obligations and consequently encourage irresponsibility and defaults. If an owner defaults on a car loan, for example, the U.S. lender can seize the automobile without going to court, but their counterparts in Europe have to first go to court where the proceedings can last for years. The U.S. lender can also go to the small claims court and most likely receive a disposition of their claim within a few weeks but the small business owner in Europe may face several years in a crowded and inefficient court system that will end up costing the business more to navigate than the value of the claim. After reading that article, the only sensible solution for most small businesses would be to accept only cash payment or a credit card. Extending credit to a customer to assist them with the purchase would be difficult to justify. NAR reported that existing home sales fell a seasonally adjusted 1.2% in June, with the annualized rate at 5.08M The rate was 15.2% higher than in June 2012, marking the 24th consecutive month of Y-O-Y increases. The median price home rose 13.5% from June 2012. Inventory levels were at a 5.2 month supply. The median time that a home was on the market was 37 days, down 47% from June 2012. There were some reports last week that China will not tolerate GDP growth less than 7%. WSJ.com One remark was attributed to Chinese Premier Li Keqiang, the top economic policy maker in China. FHFA reported that its national home price index rose .7% in May from the previous month. fhfa.gov .pdf The index is still 11.2% below its April 2007 level and is roughly where it was in January 2005. That kind of data just highlights what happens when a parabola in price hits a brick wall and comes back to earth. Zillow reported that home sales in the Spring were the hottest since 2004. The Markit "flash" manufacturing PMI for the U.S. rose to 53.2 in July from 51..9 in June. markit Markit's PMI index has been higher than the ISM version for 22 out of 24 months. MarketWatch The new orders component rose to 55.1 from 53.4. Export orders rose to 52.3 from 46.3. Bar Harbor Bankshares increased its quarterly dividend by .5 or 1.6% compared with the prior quarter. The dividend is up by 6.9% Y-O-Y. While that is modest, it is at least going in the right direction. The approach of this fund suits my temperament as an investor. The tilt is toward value and growth at a reasonable price. The fund is not going to shoot the lights out in robust stock market moves. I will review each quarterly report and the 2013 second quarter report was just released by the fund. 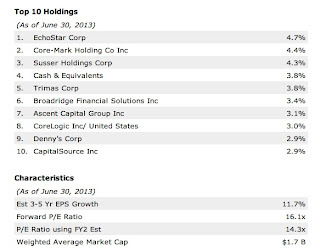 Shareholder reports can be found at the fund's website; adx_q2_2013.pdf, or at the SEC. Link to ADX Filings at the SEC. The financial websites will have an incorrect distribution yield for this fund. ADX has a 6% minimum managed distribution policy. The recent quarterly income dividend was only $.05 per share. The fund will make one large capital gains distribution at year end that will provide the bulk of that managed distribution. As noted in that 2nd quarter report, the fund had realized gains for the first six months of $26,817,557 or $.29 per share. 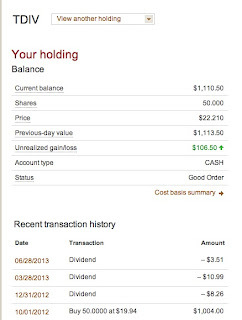 The fund had an unrealized appreciation as of 6/30/13 of $238+M and no loss carryforwards. The annual distributions since 2002 can be found at page 15. 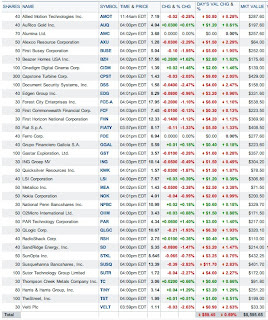 The largest single position is in another stock CEF, Petroleum & Resources (PEO), that I also own. ADX and PEO share office space and employees. The funds are not externally managed by an investment company. The expense ratio was .65% for 2012. I have quit reinvesting the dividend. Link to PEO's second quarter report: peo_q2_2013.pdf As noted in that report, PEO also has a minimum 6% managed distribution policy and will likewise source that distribution mostly from capital gains paid at year end. 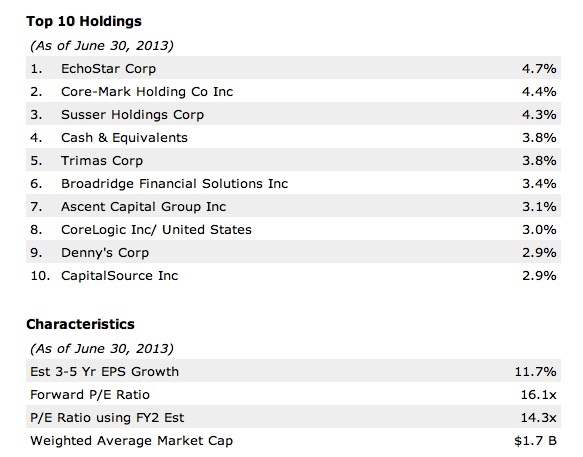 Through 6/30/13, that fund had realized gains of about 50 cents per share. I recently bought back my usual 100 share position in Husky, buying the ordinary shares available on the pink sheet exchange in the U.S. Item # 2 Bought 100 HUSKF at $26.42 (7/6/13 Post). 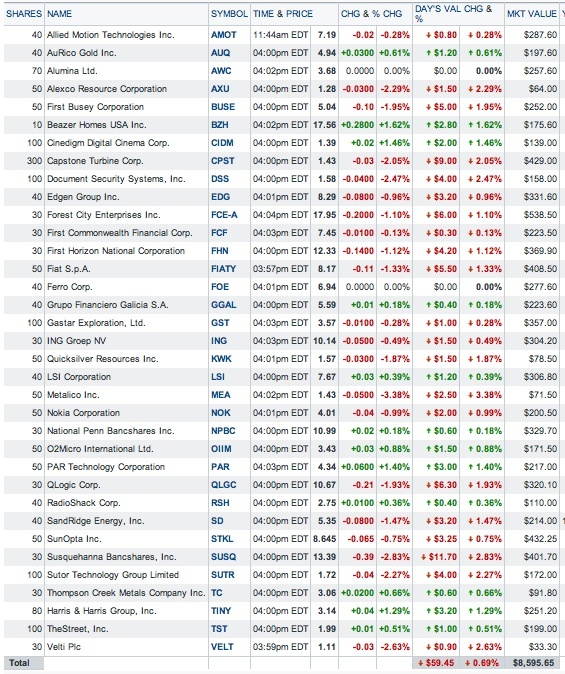 The shares have done well so far this month, closing last Friday at $29.42 +0.16. KeyCorp's stock was initially purchased in the Lottery Ticket Basket Strategy and later elevated in October 2012 to the Regional Bank Basket Strategy. Added Regional Bank Basket: 40 KEY at $7.87 December 2012; Item # 1Added 70 KEY at $8.77 October 2012; Item # 2 Bought 30 KEY at $8.75 (January 2011). During the Near Depression, I bought one of Key's trust preferred securities in the single digits: Bought KEYPRA at $7 (October 2008). That security was called in September 2011 at its $25 par value plus accrued interest. During the 2nd quarter, KEY "incurred $37 million, or $.03" per share for its "efficiency initiative". The earnings estimates for this company are not reliable. In the post discussing a purchase, I noted that the E.P.S. was $1.63 for the F/Y ending in September 2013. The estimate is now $.32. MTOR Analyst Estimates It is really hard to figure out an appropriate price when the earnings are that unpredictable. MTOR is a cyclical company and the stock can be a winner during an up cycle. The current forecast is for an E.P.S. of $.72 for the 2014 F/Y. If MTOR exceeds that estimate by a significant amount, and the market does not see a downturn on the horizon, the stock could clear $10. The last earnings report was another factor motivating the sell. Revenues declined 22%, FCF was a negative $26M and the company had a GAAP loss from continuing operations of $4M compared to $20M in net income for the year ago quarter. Rationale: This was an unsuccessful trade, even though I managed to break into profit territory. I did better on the ArvinMeritor bonds. I will invest the proceeds into an income generating security. Security Description: The Nuveen Premium Income Municipal Fund (NPI) is a leverage closed end bond fund that owns tax free municipal bonds. As shown under the "portfolio characteristics" tab at CEFConnect, this fund is weighted in "A" rated or better municipal bonds. The average duration is shown at 6.21 years at that page. Sponsor's Page: NPI - Nuveen Premium Income Municipal Fund, Inc. Rationale: As previously noted, I am devoting up to $1,000 per week toward the purchases of leveraged bond CEFs which are being hammered in price. The rationale for this approach is explained in detail in Item # 4 Added 70 BTZ at $12.63. NPI is currently paying a tax free dividend of $.072 per share. Nuveen Closed-End Funds Declare Monthly Distributions At a total cost of $12.45, the tax free dividend yield is about 6.94% assuming a continuation of that monthly dividend which is in no way assured of course. I am currently reinvesting the dividend. Risks: First, the recent carnage in the bond CEF space highlights one of their disadvantages. During times of turmoil, volatility, stress and/or downdrafts in asset values, the market price of CEFs can go down much faster than their net asset values. Second, the existence of leverage, even at a very low cost, will accelerate that decline simply due to the assets purchased with borrowed money adding to the decline that would otherwise exist for that fund without any leverage. All bond funds face interest rate risks and risks associated with interest rate normalization which is currently a significant risk for them. Interest payments are made quarterly. The issuer may call this bond on or after 3/15/15 at its par value plus accrued interest. If not redeemed early, the bond matures on 3/15/2040. According to Quantumonline, this bond is rated A3 by Moody's and A- by S & P.
This is in part a contrarian play to my own outlook for interest rates. I have to recognize that my future forecasts may be proved wrong. I view it as a low probability scenario that interest rates will remain about the same as now over the next few years, or decline some. I view the higher probability event to be a rise in long term rates caused by interest rate normalization due to the phasing out of QE and its eventual termination next year. Interest rates may accelerate up even faster than currently expected due to an upward revision in inflation expectations. In effect, the purchase of ELB is a play on being wrong about the future course of rates. This security closed at $26.55 on May 1, 2013, when the 10 year treasury was yielding 1.66%, just before the rapid increase in long term rates commenced in earnest. ELB Historical Prices Last September and October, ELB was trading mostly over $28 per share. ELB Interactive Chart If rates do decline some, this security may find some buyers, affording me a opportunity to exit the position after collecting one or more interest payments at a profit. The last ex interest date was on 6/12/13. Generally, the optimal result for this kind of security would be to collect two interest payments and to sell the security at over $27. So, I have modest upside goals. If need be, I would not mind be stuck with this one, as a result of a rise in rates, given its quality and tax free income generation when owned in the ROTH IRA. Preservation of capital and income generation are the two primary management criteria for my retirement accounts. In the unlikely event that I ever need those funds, the money better be there, rather than in money heaven. Risks: Interest rate is the most important risk. The bond owner has the risk associated with a rise in rates, while the issuer has the right to call the bond at par value in the event interest rates fall and refinancing is worthwhile. It is a heads the issuer wins, tails the bond owner loses, kind of situation. 5. Sold 50 TDIV at $22.26 Roth IRA (see Disclaimer): The First Trust ETF VI NASDAQ Technology Dividend Index Fund is an ETF that focuses on dividend paying technology stocks. Rationale: The income generation is low. I basically substituted the higher yielding ELB for TDIV. The overall percentage total return was about 12.42% for the TDIV trade, realized in 9+ months. As a practitioner of an enhanced version of turtle investing in my retirement accounts, I am not likely to hit any home runs, but I find with a continuous series of singles, walks, hit by pitches and an occasional double. 6. Sold 50 ANCX at $14.9 (REGIONAL BANK BASKET STRATEGY) (see Disclaimer): I thought that I owned 100 shares of ANCX but could only find 50 shares. Access National is a small regional bank based in Reston, Virginia. Recent Earnings Report: Access National reported a second quarter E.P.S. of $.34 cents per share or $.31 on a pro forma basis which assumes no contribution from the Denver mortgage loan operation. The E.P.S. was $.38 in the 2012 second quarter or $.27 on the pro forma basis.The consensus estimate was for $.27. I do not know whether that estimate is the GAAP or pro forma number but suspect that it is a pro forma number that excludes the Denver operation. Rationale: Prior to the earnings release, the consensus E.P.S. estimate was for $1.14 in 2013 and $1.02 in 2014. ANCX Analyst Estimates While that consensus may be too pessimistic, it does highlight an issue relating to valuation at the $15 share price. The process that led to the closure of the Denver mortgage loan office is of some concern. As noted in a 8-K filing, the decision was made by management and then communicated to the Board, as if the Board had nothing to say on the matter (see first sentence). The closure of that office had a sufficiently important impact on earnings that someone at the bank felt the need to prepare pro forma statements showing the earnings as if the Denver office did not exist and then compare those results to the much higher reported results. I left a comment to a Seeking Alpha discussing that issue along with the recent earnings report. 7. Initiated Position in BIAUX at $21.29 (see Disclaimer): The Brown Advisory Small-Cap Fundamental Value Fund (BIAUX) is a mutual fund. I decided to add a small cap value fund after I came across this data from Fidelity which compared the result of value and growth indexes between 1980-2010. Fidelity Learning Center Value indexes beat growth indexes and the small cap value index smashed all of the others in performance. That may be a good reason to go light on this category going forward. Over the 31 year period reflected in Fidelity's table, a $10,000 investment in the small cap value index would have grown to $601,860, while large cap growth rose to $187,071. This purchase is part of a paired trade. I will discuss what I sold in the post. This one is already long enough.